Food has always connected us; to our families and homes, our cultures and religions, to the geography and climate of the earth. In fact, our foods connect us to the whole of life. So inseparable are we from our meals that our days revolve around what we eat, when we eat, or, for some on our planet, whether or not there will be anything to eat at all. No matter how much or how little we have, sharing a meal with friends, family or even strangers is our greatest social interaction. Now, imagine eating dinner with thirty different families in twenty-four different countries. Award-winning science and technology photographer Peter Menzel and his equally accomplished producerjournalist partner and wife Faith D’Aluisio did just that. They journeyed to Japan, China, Mongolia, Bhutan, and India, to Australia, the Philippines and Turkey, throughout Europe, into the Americas and up to Greenland. 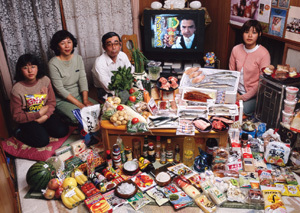 In the process, they captured revealing and intimate portraits of what each family eats in the course of one week. 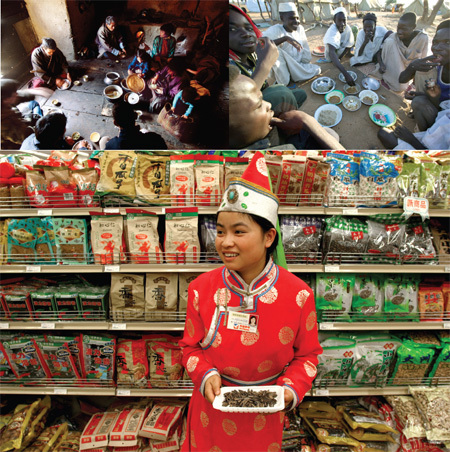 Menzel and D’Aluisio convey their poignant insights of our global relationship with food in their newest book, Hungry Planet, What the World Eats. 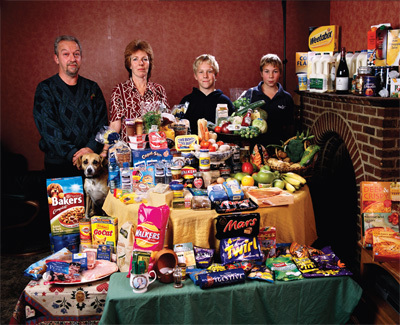 The intent was to document how globalization is affecting diets around the world, and they observed an alarming trend: The preponderance of packaged, processed food in the diets of the urban and the affluent everywhere. SuperConsciousness Magazine talks with Peter Menzel about what they refer to as “the greatest change in global diets since the onset of agriculture”, and our escalating vulnerability as a result. SC: Peter, what have you come to understand about our relationships with food through the experience of creating this book? PM: Well one of the really important things we see in developing countries is nutrition transition. Once people have more income, more disposable income, they veer away from their very simple diets of whole grains and legumes, really basic simple natural foods, and they start eating more meat, more fat and more sweet things. And it’s human nature to do that, because protein makes you stronger, and fat and sugar taste good. In the short term, and in moderation, those things are very good for you too, but in excess and because we live longer, we start to suffer from those foods at a certain point. It is only recently that people are living to be 60, 70, 80 years old, well beyond the 40 years most people lived in America just over a hundred years ago. Also, monitoring the consumption of those foods is much more difficult. Once you get a taste for them it’s hard to know when to stop. For thousands of years, these foods were the most difficult to obtain, so, genetically, there’s no builtin moderation. Once a person’s income allows easy access to these foods, we go overboard on them. And that’s what has happened to Americans: We’re eating processed foods, mostly, primarily. But this is happening all over the world. For instance, the recent 2008 World Watch Report states that China now consumes 50 kilograms of meat per person. They’ve surpassed Europe. The average European consumes 44 kilograms of meat per person, and this report is generated from data collected for the year 2005. SC: Not that long ago in China, a rat was great fare. PM: Yes, and the transition in China has occurred very quickly. Only 30 years ago, during the Cultural revolution, the Chinese barely had enough to eat, and starvation claimed millions of lives. SC: This nutrition transition, the access to easily available foods also correlates to urban living. Very few of the families profiled in your book live indigenously. PM: There’s very little of it, even in places like Mali. 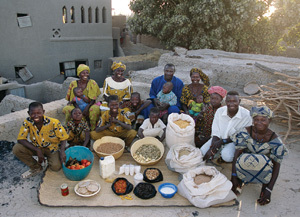 I was really blown away when we went back to Mali because I had been there previously for another project. All of a sudden in a remote village of mud houses on the Niger River, they had cold sodas and a television set that was run by a solar panel on top of the roof of the barbershop. The Mali men were sitting around watching this black and white TV, watching a crime show from Los Angeles. SC: They’ve transitioned from hunter/ gatherers to renewable energy, bypassing dependency on fossil fuels. That’s a good thing. PM: In Africa, you also don’t see telephones lines strung everywhere. They bypassed copper and went straight to cell phones. SC: You’ve observed many of these kinds of changes all over the world. There’s an abundance of food in urban areas, easily available calories, something new and very rare for our species. We no longer live close to the earth. How do you view the vulnerability of so many people dependent on commercially packaged, processed and pre-prepared foods? PM: Society, in general, is losing respect for food. And in the United States that’s especially true because only 2 percent of the population is involved in producing food. The reason we’re losing respect is because of the abundance and the availability of it. We eat too much of it, we throw too much of it away, and it’s really, really cheap due to subsidies and mass production. We’ve got a disconnect. We don’t understand where our food comes from. Kids grow up in cities and don’t know that hamburgers come from cows. They can’t really make that connection of where their corn dog comes from, where corn actually comes from or what corn even looks like. Farms are becoming big industrial complexes that are far removed from small towns and cities. The respect that used to be given to farmers and fruit producers has pretty much gone by the wayside. We’ve become complacent about expecting to have a cornucopia of food right in our neighborhood, in everybody’s neighborhood. And what you’re saying, too, about processed food; this is really, really dangerous because its not food anymore, its something else. We’ve been taught that processed food and vitamins and supplements can replace real food. They really can’t. It’s not the same thing. SC: Your book really surprised me, the pervasiveness of packaged foods internationally. 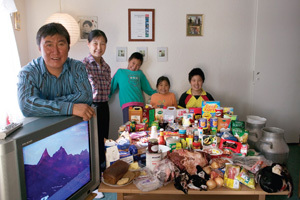 And of all the families you profiled, the one that amazed me the most was the family in Greenland; there on the table is polar bear meat, alongside packaged food. PM: Greenland is fascinating but there’s another story there. Greenland is Denmark’s protectorate. The packaged food is subsidized by Denmark, so it’s not as expensive as you would think even thousands of miles from the source. It comes by ship during the summer and they fly it in the rest of the year when the weather is permitting. Why Greenland is so important and why Denmark is so interested is because there’s oil under the rock under the ice cap, but they haven’t figured out how to drill down through a mile of ice to get to that oil. Emil and his family are still hunter/ gatherers in Greenland and go out for weeks at a time to hunt musk ox, even in the winter when it’s 40 below and dark all the time – and he’s passing this on to his sons. We went dog sledding to fish and hunt seal with the family. They are one of the last families that have dog sleds, and not snowmobiles. There are on a few dozen families left in an area of about 500 people who rely on dogs. One of their favorite things is to go off dog sledding onto a glacial lake, make a hole in the ice and pull out char, which is just so delicious. If they come upon a polar bear, they go crazy. They have 40 dogs, so in addition to feeding themselves, they must also take care of them. SC: It seems so ironic that at this time of easily obtainable high-protein, high-fat and sweet foods, albeit disconnected from the production of these foods, we are also entering a period of great vulnerability to increasingly abrupt climate shifts. Historically, similar patterns have been correlated with the fall of civilizations as well as the displacement of agricultural food producing regions due to drought or flood. The obvious dependency on packaged foods that you captured so brilliantly in your book would seem to make us all the more vulnerable, not just on a societal and cultural level, but on a personal level as well. PM: Yeah, on the personal level we understand that too, because we live in the Napa Valley, earthquake country. We’ve got a fairly substantial garden at home but we’ve also got an aluminum trash can, – with 50 pounds of rice, and a 30 pound bag of beans. And, you know, we’ve got a couple of months of food if we ever need it. At the end of every year, we give those bags to the food bank and every year we replace them again. We’ve just got that sitting in our pantry, along with enough local wine to make the beans and rice more fun. Face to Face With Dinner… Literally. In an effort to promote the reality that eating meat involves killing animals, leading chefs such as Mr. Oliver, Dan Barber and David Burke have begun to advertise a new familiarity with the animals they cook. Quality meat is not the only factor in question. Although many chefs believe meat from healthier, happier animals tastes better, some chefs are promoting a sense of responsibility for both the life treatment, and manner of death the animals they cook receive. Mr. Oliver states, “the question is, how and why should we care about an animal when we are going to bloody eat it?” The answer is, respect. As part of his television show, “Jamie’s Fowl Dinners,” Mr. Oliver demonstrated some techniques used by the standard poultry industry. These included suffocating a group of male chicks in a chamber of carbon dioxide, and stuffing birds into a filthy battery cage that today houses 95 percent of the country’s chickens. His message at the end of the show: The only reason for the miserable lives lived by most chickens is your insistence on cheap food. If people would be willing to pay a little more for the birds they buy, they would not only be receiving higher quality meat, but the birds themselves would be able to live better lives. Other chefs such as Charlie McManus of Tacoma, WA, John Besh of New Orleans, Dan Barber of Blue Hill in New York, and Tamara Murphy at Brasa in Seattle have also introduced ways of becoming more familiar with and responsible for the meat they cook. “It’s our responsibility and our privilege to educate our customers,” Charlie McManus states. “A lot of them don’t want to hear it, but that’s just sticking your head in the sand.” By coming face to face with the food they cook, these chefs are not only promoting respect for the animals we eat, they are also paving the way to a healthier, happier food market.